If you love your pet, this is the perfect design for you! 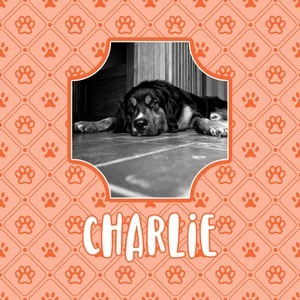 Put this fun design on their own blanket, pillow, or pet bowl mat. Their space will never look more fabulous. This design is a bright peach with accents of orange. In the middle, you can upload your favorite picture of your pet! It's a breeze with our design center. Underneath their picture, put their name or a fun saying. The background is filled with a fun pattern of pawprints and bones. This will be the perfect design for a sweet puppy. In our design center you can change as many or as few of the aspects of this design. Change the colors, background, frame, or font! Change a little or change it all! If you ever need any help in our design center, be sure to get in contact with us. We are always happy to help!